What a malleable material bread is. You can make anything out of it. I made a lot of salt dough designs including ‘dummy’ bread once, painted them, varnished them and sold them. Some of them are still going. Salt dough really does need to be varnished though, damp is it’s natural enemy, and once it gets into the dough – well that’s the end of it really. bread the staff of life and death? You used to see dough sculpture in many a country kitchen, nowadays it rears it’s head in the most unlikely places and with the most amazing results. Kittiwat Unnarom is a Fine Art student who makes amazing bread sculptures (see above). 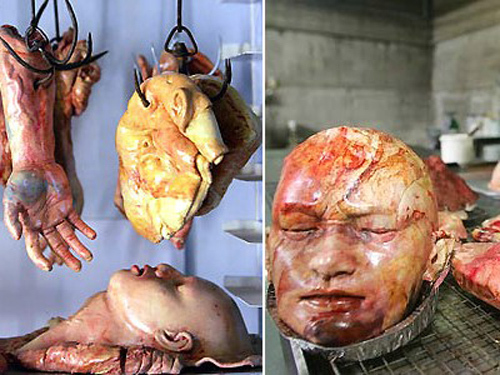 He makes body parts from bread! Not salt dough but bread. They are startlingly realistic and what’s more they are edible and alleged to be delicious! He has his own bakery, called ‘Body Bakery’ in Thailand. From the video, it looks like a raging success too! Now with bread, you’ve just got to have butter. 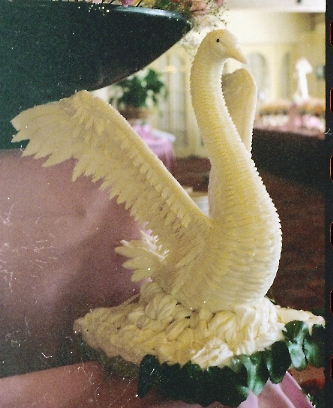 So here’s a beautiful edible sculpture. Seems a shame to eat it doesn’t it? Here is the website (below) where the above sculpture came from. All the sculptures use food as a medium (including ice). Some of these are absolutely marvelous I think! This entry was posted on October 23, 2009 at 1:01 am and is filed under ART, SCULPTURE, WEIRD AND WACKY DESIGN with tags bread art, bread sculpture, edible sculpture, salt dough. You can follow any responses to this entry through the RSS 2.0 feed. You can leave a response, or trackback from your own site.